Air101: Aircraft Evacuation Sling For Wheelchair Users? Aircraft Evacuation Sling For Wheelchair Users? 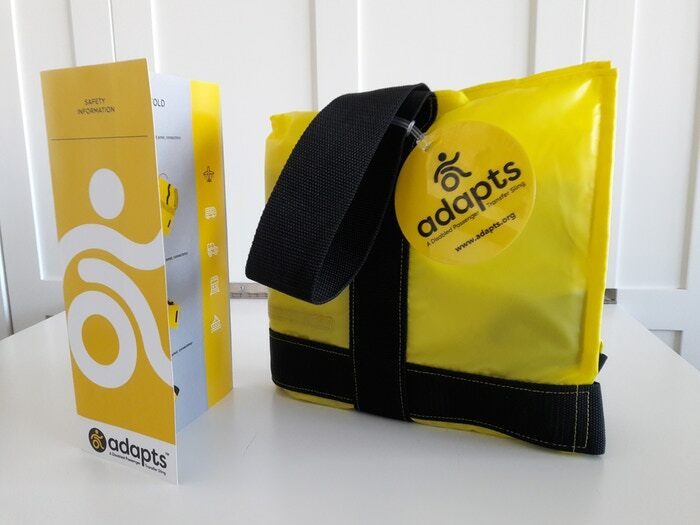 ADAPTS today announced the launch of a crowdfunding campaign on Kickstarter for the world's first affordable and portable emergency evacuation sling for wheelchair users on an aerolane. Simultaneously, A Disabled Passenger Transfer Sling (ADAPTS), will be demonstrated for the first time at the Abilities Expo in San Mateo, Calif. this weekend. "When I was a flight attendant, I knew we needed a better way to save people, an actual device to move passengers with disabilities away from an aeroplane crash fast," Robin Wearley, founder of ADAPTS LLC, said. Precious Time and Lives Can be Saved with ADAPTS, "Products like the ADAPTS system fill an important safety need for the entire disabled community," Jeff Butler, 2016 Paralympic Games USA wheelchair rugby team silver medalist, said. Kickstarter Brings ADAPTS to the World. From 27th Oct. through to 18th Dec. ADAPTS will be available through Kickstarter for a pre-order price of $129. The yellow sling is made from sturdy life jacket fabric and folds into a tote. Backers can support ADAPTS at a variety of reward levels. More information about ADAPTS and its Kickstarter campaign can be found here, http://www.adapts.org and https://www.kickstarter.com/projects/adapts/adapts-a-disabled-passenger-transfer-sling.